The lightspeed-progression of freestyle skiing means that skiers are demanding more and more of their equipment. 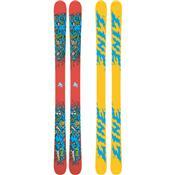 Line answers this demand for more durable freestyle skis with the Afterbang. Designers threw away everything they knew about ski construction and turned to action-sports' most respected and most durable construction-the skateboard deck. the 7-ply maple veneer layout is ultra-strong without weighing a ton.